Sommer: "Automakers have effectively delivered electric vehicles that can satisfy the needs of most American drivers." 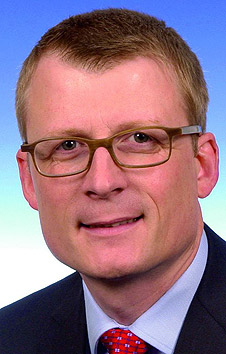 Editor's note: An incorrect photo of Joerg Sommer was published in an earlier version of this story. WASHINGTON -- Volkswagen of America’s top product executive called on federal and state governments to do more to spur electric vehicle sales and EV infrastructure development at an event here today. Joerg Sommer, vice president of product marketing and strategy at VW of America, also announced that the automaker will invest $10 million in EV charging infrastructure by 2016. In a keynote speech at the Electric Drive Transportation Association’s annual conference, Sommer said VW’s investment and those made by other companies should be joined by additional governmental investment to support EVs. Sommer called for federal spending on EV fast-charger installations in cities and along highway corridors; an extension of a tailpipe emissions credit multiplier for plug-in vehicles that will shrink from the 2017 through 2021 model years; and state and federal fleet operators to buy more plug-in hybrids and battery-electric vehicles. The call for additional government support of EVs comes amid tepid demand for them. Automakers collectively have invested billions of dollars in EV technologies and charging infrastructure in large part because of toughening tailpipe emissions and fuel economy regulations that will grow more stringent between now and 2025. Some 24 plug-in electric and hydrogen fuel cell models are on the market, and another 20 are expected to arrive through next year, according to the EDTA. Automakers have supported EV sales by installing fast-charging infrastructure in cities and along major highway corridors. Nissan has installed more than 800 charging stations in the U.S. since launching the Leaf EV in 2010 and projects adding another 900 chargers by April 2016, the company says. VW’s $10 million investment includes a joint project with BMW and ChargePoint to install 100 fast-charging stations along the U.S. East and West coasts by the end of the year. Tesla also has built an extensive network of fast-charging stations for its Model S electric sedan. Yet through January, fewer than 300,000 plug-in hybrid and battery-electric vehicles have been sold in the United States since 2011, according to figures from the EDTA, far short of President Barack Obama’s goal announced that year to put 1 million EVs on the road by 2015. Meanwhile, auto manufacturers and policymakers are gearing up for the midterm review of fuel economy requirements for the 2022 through 2025 model years that begins in 2017.